i recently finished some new pieces for the shop. 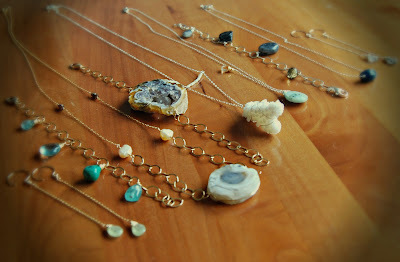 i am SO excited about these pieces, as they are more and more in the direction i see my shop going. i love the natural shape to the stones and the simple elegance the pieces come together to create. i have always been rather minimalist in my jewelry choices, and yet, i do love a nice statement piece from time to time. i think these new pieces encompass both aspects. i have the pictures uploaded to my computer and am currently in the process of editing them. next will be giving these babies names and getting their listings up and ready on etsy! spy any you'll be keeping you eye out for in the shop? be sure to check averybethdesigns for my latest additions! and don't forget the sale going on now throughout the entire shop! enter LOVEMOM at checkout to get 10% off your order! perfect chance to get your mom (or you!) a special little something for mother's day.